So the mission was to set static member for connectionString , so that we’ll get the string from web.config just once. On the way we did Encrypt and Decrypt of the connectionString. So the trouble was that we couldn’t be sure that the static field is staying or going on the request- response model of WebApi. The easy solution was to reuse the existing code to init HttpContext.Current.Application[“connectionString”] value if it’s null at the global.asax at Application_Start function. When initialized in that function at the host/server side of the distributed system , the HttpContext.Current.Application[“connectionString”] is initialized for the first time and until the IISReset. The trouble was that the Application variable has been resetting itself each request. The solution was that because of decryption that has been saving the web.config it has been resetting the site values held by the IIS, so actually it has been recycling the site data resetting the Application variables values also. At the end the encryption has been executed on publish to the server, the decrypt has been decrypting the secured section but hasn’t been saving it back , so the web.config actually haven’t changed throughout running host , so the Application data kept intact. 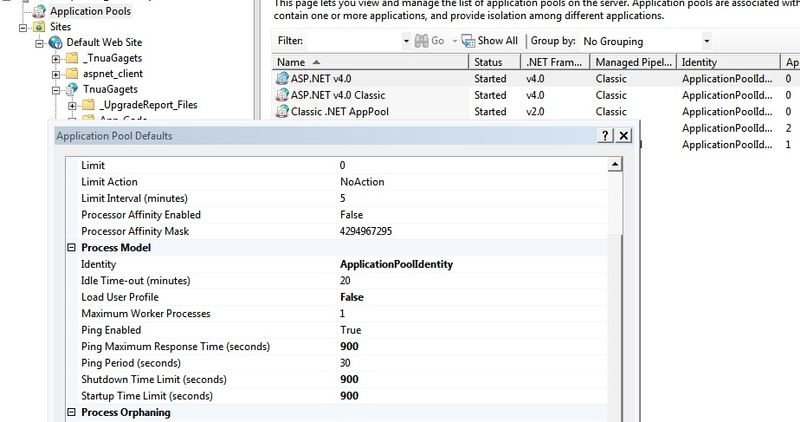 run –> inetmgr –> enter –> click on App Pool -> right-click on App –> set Application Pool Defaults –> just change everything with (seconds) to 900 instead of 90.